While so many of the holiday carols we love talk about how there’s “no place like home for the holidays”, the truth is many of us have to travel to get back home. There’s no denying that holiday travel can be a headache, so I try to do as much as possible on my end to make it easier. Packing only the essentials and utilizing what I can from my destination, either from a hotel or a friend. Simplifying my packing has not only saved me baggage fees, but it’s also helped me be more productive once I arrive at my destination. When traveling, I don’t bring a big purse. Not only do I not want it to be counted as my “personal item”, but frankly, I don’t see the need for it once I’m at my destination. I prefer a wristlet that can easily fit in a larger tote for when I’m on the plane and that can carry all my essentials, both during travel and once I get to my destination. 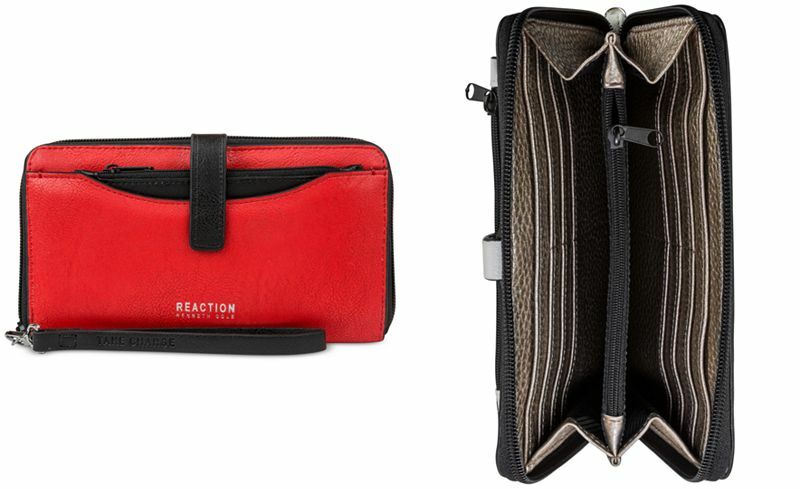 The bonus I found in this sleek faux leather wristlet from Kenneth Cole Reaction is its multitasking power! It comes complete with a portable charger and and RFID theft protection, a thin lining designed to prevent against “electric pickpocketing”, and who doesn’t need that while traveling? As I mentioned, I don’t want to waste the one “personal item” I can bring on the plane with a purse. So I carry a day bag that I can keep my wristlet and everything I need to survive in the airport, on the plane and during a layover. 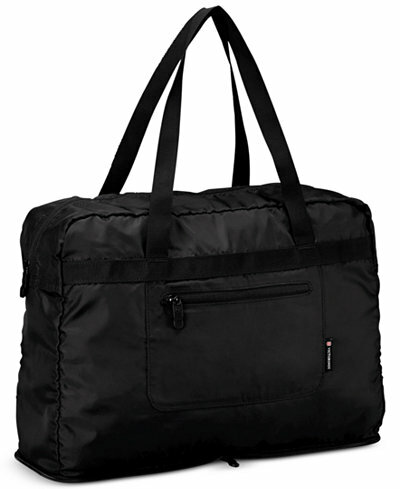 This lightweight day bag also has enough room for any gifts or souvenirs you may have picked up along the way. And the bonus? The compact construction folds up neatly to easily stow away in luggage, so you always have a bag on hand when you need it. Size is everything these days when it comes to what you’re allowed to bring on the plane with you. While some prefer the sleek look of a hard case, I prefer a soft-sided case with wheels that is pliable enough to squeeze into a tightly filled overhead compartment. Of course, it doesn’t hurt to have a little stretch for the return flight when you may be traveling home with more than when you left. My final tip is to select a bright, bold color when choosing your holiday travel bags. The last thing you want is to lose your bags in a see of black. I’m partial to this Ruby Red Samsonite available only at Macy’s. So there you have it, the 3 bags you need for holiday travel. If getting there is half the journey, then let’s make that journey as easy as possible. What is your go-to travel bag?